Insights are derived from information; what sits behind it; ‘what is really going on’. For a comprehensive article with everything you ever needed (or wanted!) to know about Shopper Insights, visit Shopper Insights Explained. It’s no good having information without insights, and there’s no point in driving insights unless you’re doing to DO something with them. Good insights need to be turned into implications (‘so what this means is …) which in turn form the basis of strategy. Shopper related information and insights are an input, along with category, consumer, channel and market intelligence and analysis, into formulating category, channel, customer/account, and point of purchase strategy. 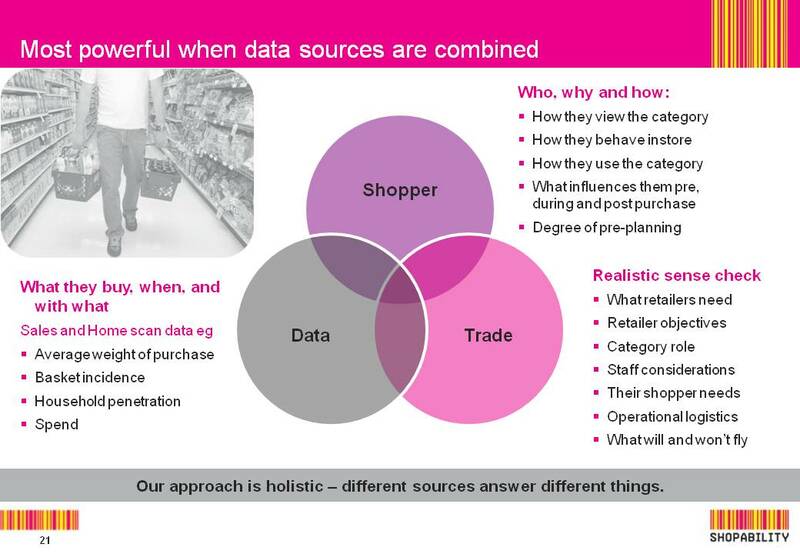 At ShopAbility we use multiple information sources to formulate insights which then form the basis of strategy. Find out more about Shopper Research and definitions, methodologies at What is Shopper Research?